COLUMBIA, S.C.- Tickets for the Clemson vs College of Charleston baseball game will go on sale on Friday, January 18 at 10:00am. The two teams will face off at the newly-renamed Segra Park (formerly Spirit Communications Park) on Wednesday, March 20 at 7:00pm. Gates will open at 5:30pm and parking will be $4 for the game. "We are excited about coming to Columbia to play Clemson in beautiful Segra Park," said Chad Holbrook, College of Charleston head baseball coach. "It's a great opportunity to play a great opponent in what promises to be a terrific baseball atmosphere. We are grateful to both the Fireflies and to Monte for helping us put this game together." Tickets are available online at FirefliesTickets.com, over the phone at 803-726-4487 or at the Fireflies Box Office. College of Charleston will be in the third base dugout and Clemson will be in the first base dugout for this in-state matchup. For group pricing and hospitality options, please contact the Fireflies Box Office at (803) 726-4487. "We are excited to welcome the College of Charleston back to Segra Park and to welcome the Clemson University baseball team for the first time," said Columbia Fireflies team president John Katz. "Segra Park was built not only for the Fireflies, but for the entire community. I can think of no better way to celebrate the community than by hosting two great South Carolina collegiate baseball programs and their strong Columbia-based alumni networks." 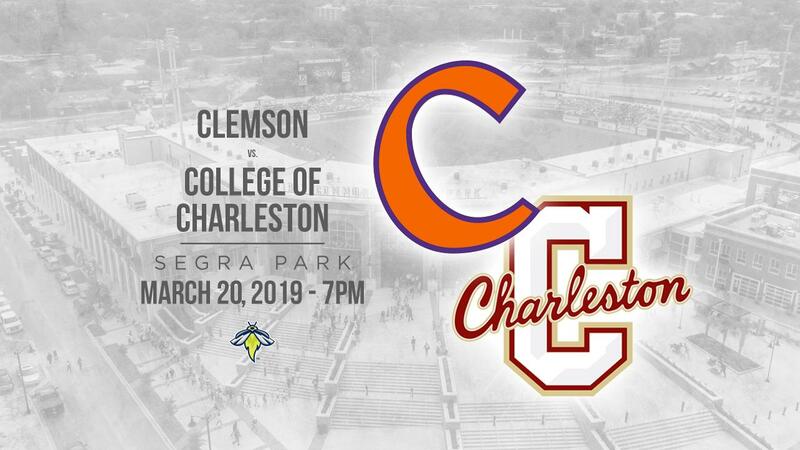 The College of Charleston baseball team has previously played at Segra Park, but this will be the first game played at the ballpark for the Clemson University baseball team. In their first appearance at the ballpark in 2018, College of Charleston beat the University of South Carolina, 9-0. "We are excited to play a great program in College of Charleston in a beautiful ballpark like Segra Park," said Clemson head baseball coach Monte Lee last fall. "We have a huge Clemson following in the Midlands and look forward to bringing our team there to play. It's always special for me personally as well to play my alma mater and a program that's very special to me."